The object of calcining or roasting certain ores before treatment is to dissipate the sulphur or sulphides of arsenic, antimony, lead, etc., which are inimical to treatment, whether by ordinary mercuric amalgamation or lixiviation. The effect of the roasting is first to sublimate and drive off as fumes the sulphur and a proportion of the objectionable metals. What is left is either iron oxide, "gossan," or the oxides of the other metals. Even lead can thus be oxidised, but requires more care as it melts nearly as readily as antimony and is much less volatile. The oxides in the thoroughly roasted ore will not amalgamate with mercury, and are not acted on by chlorine or cyanogen. To effect the oxidation of sulphur, it is necessary not only to bring every particle of sulphur into contact with the oxygen of the air, but also to provide adequate heat to the particles sufficient to raise them to the temperature that will induce oxidation. No appreciable effect follows the mere contact of air with sulphur particles at atmospheric temperature; but if the particles be raised to a temperature of 500 degrees Fahr., the sulphur is oxidised to the gaseous sulphur dioxide. The same action effects the elimination of the arsenic and antimony associated with gold and silver ores, as when heated to a certain constant temperature these metals readily oxidise. The science of calcination consists of the method by which the sulphide ores, having been crushed to a proper degree of fineness, are raised to a sufficient temperature and brought into intimate contact with atmospheric air. It will be obvious then that the most effective method of roasting will be one that enables the particles to be thoroughly oxidised at the lowest cost in fuel and in the most rapid manner. First or A Process.—Roasting on a horizontal and stationary hearth, the flame passing over a mass of ore resting on such hearth. 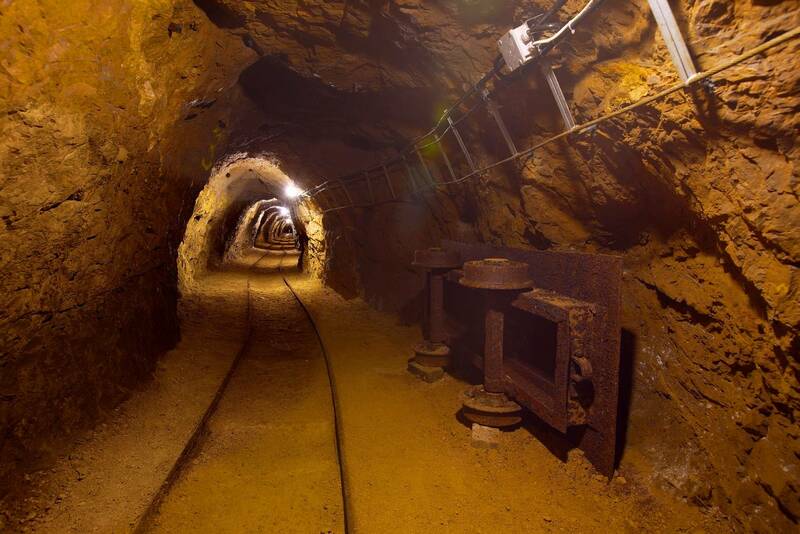 In order to expose the upper surface of the ore to contact with air the material is turned over by manual labour. This furnace of the reverberatory type is provided with side openings by which the turning over of the ore can be manually effected, and the new ore can be charged and afterwards withdrawn. Second or B Process.—Roasting in a revolving hearth placed at a slight incline angle from the horizontal. The furnace is of cylindrical form and is internally lined with refractory material. It has projections that cause the powdered ore to be lifted above the flame, and, at a certain height, to fall through the flame and so be rapidly raised to the temperature required to effect the oxidation of the oxidisable minerals which it is desired to extract. The rate, or speed, of revolution of this revolving furnace obviously depends upon the character of the ore under treatment; it may vary from two revolutions per minute down to one revolution in thirty minutes. Any kind of fuel is available, but that of a gaseous character is stated to be by far the most efficient. Any ordinary cylinder of a length of 25 ft., and a diameter of 4 ft. 6 in., inclined 1 ft. 6 in. in its length, will calcine from 24 to 48 tons per diem. Another form of rotating furnace is one in which the axis is horizontal. It is much shorter than the inclined type, and the feeding and removal of the ore is effected by the opening of a retort lid door provided at the side of the furnace. Openings provided at each end of the furnace permit the passage of the flame through it, and the revolution of the furnace turns over the powdered ore and brings it into more or less sustained contact with the oxidising flame. The exposure of the ore to this action is continued sufficiently long to ensure the more or less complete oxidation of the ore particles. Third or C Process.—In this process the powdered ore is allowed to fall in a shower from a considerable height, through the centre of a vertical shaft up which a flame ascends; the powdered ore in falling through the flame is heated to an oxidising temperature, and the sulphides are thus depleted of their sulphur and become oxides. Another modification of this direct fall or shaft furnace is that in which the fall of the ore is checked by cross-bars or inclined plates placed across the shaft; this causes a longer oxidising exposure of the ore particles. When the sulphur contents of pyritous ores are sufficiently high, and after the ore has been initially fired with auxiliary carbonaceous fuel, it is unnecessary, in a properly designed roasting furnace, to add fuel to the ore to enable the heat for oxidation to be obtained. The oxidation or burning of the sulphur will provide all the heat necessary to maintain the continuity of the process. The temperature necessary for effecting the elimination of both sulphur and arsenic is not higher than that equivalent to dull red heat; and provided that there is a sufficient mass of ore maintained in the furnace, the potential heat resulting from the oxidation of the sulphur will alone be adequate to provide all that is necessary to effect the calcination. TYPES OF FURNACES OF THE DIFFERENT CLASSES THAT ARE IN ACTUAL USE. "A" OR REVERBERATORY CLASS. The construction of this furnace has already been sufficiently described. If the roasting is performed in a muffle chamber, the arrangement employed by Messrs. Leach and Neal, Limited, of Derby, and designed by Mr. B. H. Thwaite, C.E., can be advantageously employed in this furnace, which is fired with gaseous fuel. The sensible heat of the waste gases is utilised to heat the air employed for combustion; and by a controllable arrangement of combustion, a flame of over 100 feet in length is obtained, with the result that the furnace from end to end is maintained at a uniform temperature. By this system, and with gaseous fuel firing, a very considerable economy in fuel and in repairs to furnace, and a superior roasting effect, have been obtained. Where the ordinary reverberatory hearth is fired with solid coal from an end grate, the temperature is at its maximum near the firing end, and tails off at the extreme gas outlet end. The ores in this furnace should therefore be fed in at the colder end of the hearth and be gradually worked or "rabbled" forward to the firing end. One disadvantage of the reverberatory furnace is the fact that it is impossible to avoid the incursion of air during the manual rabbling action, and this tends to cool the furnace. The cost of roasting, to obtain the more or less complete oxidation, or what is known in mining parlance as a "sweet roast" (because a perfectly roasted ore is nearly odourless) varies considerably, the variation depending of course upon the character of the ore and the cost of labour and fuel. There are several modifications of the reverberatory furnace in use, designed mechanically to effect the rabbling. One of the most successful is that known as the Horse-shoe furnace. In plan the hearth of the furnace resembles a horse-shoe. The stirring of the ore over the hearth is effected by means of carriages fixed in the centre of the furnace and having laterally projecting arms, carrying stirrers, that move along the hearth and turn over the pulverised ore. In operation, half the carriages are traversing the furnace, and half are resting in the cooling space, so that a control over the temperature of the stirrers is established. This furnace is stated to be more economical in labour than other mechanically stirred reverberatory furnaces, and there is also said to be an economy in fuel. Usually the mechanical stirring furnaces give trouble and should be avoided, but the horse-shoe type possesses qualifications worthy of consideration. Of these the best known to me are: The Howell-White, the Bruckner, the Thwaite-Denny, and the Molesworth. The Bruckner is a cylinder, turning on the horizontal axis and carried by four rollers. The batch of ore usually charged into the two charging hoppers weighs about four tons. When the two charging doors are brought under the hopper mouth, the contents of the hopper fall directly into the cylinder. The ends or throats of the furnace are reduced just sufficiently to allow the flame evolved from a grated furnace to pass completely through the cylinder. A characteristic size for this Bruckner furnace is one having a length of 12 feet and a diameter of 6 feet. A furnace of this capacity will have an inclusive weight (iron and brickwork) of 15 tons. The time of operation, with the Bruckner, will vary with the character of the ore under treatment and the nature of the fuel employed. Four hours is the minimum and twelve hours should be the maximum time of operation. By the addition of common salt with the batch of ore, such of its constituents as are amenable to the action of chlorine are chlorinated as well as freed from sulphur. Where the ore contains any considerable quantity of silver which should be saved, the addition of the salt is necessary as the silver is very liable to become so oxidised in the process of roasting as to render its after treatment almost impossible. I know a case in point where an average of nearly five ounces of silver to the ton, at that time worth 30s., was lost owing to ignorance on this subject. Had the ore been calcined with salt, NaCl, the bulk of this silver would have been amalgamated and thus saved. It was the extraordinary fineness of the gold saved by amalgamation as against my tests of the ore by fire assay that put me on the track of a most indefensible loss. The Howell-White Furnace.—This furnace consists of a cast iron revolving cylinder, averaging 25 feet in length and 4 ft. 4 in. in diameter, which revolves on four friction rollers, resting on truck wheels, rotated by ordinary gearing. The power required for effecting the revolution should not exceed four indicated horse-power. The cylinder is internally lined with firebrick, projecting pieces causing the powdered ore to be raised over the flame through which it showers, and is thereby subjected to the influence of heat and to direct contact oxidation. The inclination of the cylinder, which is variable, promotes the gradual descension of the ore from the higher to the lower end. It is fed into the upper end, by a special form of feed hopper, and is discharged into a pit at the lower end, from which the ore can be withdrawn at any time. The gross weight of the furnace, which is, however, made in segments to be afterwards bolted together, is some ninety to one hundred tons. The furnace is fired with coal on a grated hearth, built at the lower end; it is more economical both in fuel and in labour than an ordinary reverberatory furnace. The Thwaite-Denny Revolving Furnace.—This new type of furnace, which is fired with gaseous fuel, is stated to combine the advantages of the Stetefeldt, the Howell-White, and the Bruckner. It is constructed as follows:—Three short cylinders, conical in shape and of graduated dimensions, are superimposed one over the other, their ends terminating in two vertical shafts of brickwork, by which the three cylinders are connected. The powdered ore is fed into the uppermost cylinder and gravitates through the series. The highest cylinder is the largest in diameter, the lowest the smallest. The gas flame, burnt in a Bunsen arrangement, enters the smallest end of the lowest cylinder and passes through it; then returns through the series and the ore is reduced by the expulsion of its sulphur, arsenic, etc., as it descends from the top to the bottom. The top cylinder is made larger than the one below it and the middle cylinder is made larger than the lowest one in proportion to the increased bulk of gases and ore. The powdered ore in descending through the cylinders is lifted up and showers through the flame, falling in its descent a distance of over 1000 feet. By the time it reaches the bottom the ore is thoroughly roasted. Provision is made for the introduction of separate supplies of air and gas into each cylinder; this enables the oxidising treatment to be controlled exactly as desired so as to effect the best results with all kinds of ore. Each cylinder is driven from its own independent gearing, and the speed of each cylinder can be varied at will. The output of this type of furnace, the operations of which appear to be more controllable than those of similar appliances, depends, of course, upon the nature of the ore, but may be considered to range within the limits of twelve to fifty tons in twenty-four hours, and the cost of roasting will vary from 2s. 6d. to 4s. per ton, depending upon the quality of ore and of fuel. The gaseous fuel generating system permits not only the absolute control over the temperature in the furnace, but the use of the commonest kinds of coal, and even charcoal is available. The power required to drive the Thwaite-Denny furnace is four indicated horse-power. The Molesworth Furnace also is a revolving cylindrical appliance, which, to say the least of it, is in many respects novel and ingenious. It consists of a slightly cone-shaped, cast-iron cylinder about fourteen feet long, the outlet end being the larger to allow for the expansion of the gases. Internal studs are so arranged as to keep the ore agitated; and spiral flanges convey it to the outlet end continually, shooting it across the cylinder. The cylinder is encased in a brick furnace. The firing is provided from outside, the inventor maintaining that the products of combustion are inimical to rapid oxidisation, to specially promote which he introduces an excess of oxygen produced in a small retort set in the roof of the furnace and fed from time to time with small quantities of nitrate of soda and sulphuric acid. Ores containing much sulphur virtually calcine themselves. I have seen this appliance doing good work. The difficulties appeared to be principally mechanical. There are other furnaces which work with outside heat, but I have not seen them in action. In one form of this furnace, instead of allowing the ore to descend in a direct clear fall the descent is impeded by inclined planes placed at different levels in the height of the shaft, the ore descending from one plane to the other. The Stetefeldt Shaft Furnace.—Although very expensive in first cost, has many advantages. No motive power is required and the structure of the furnace is of a durable character. Its disadvantages are:—Want of control, and the occasionally imperfect character of the roasting originating therefrom. A good furnace should bring down the sulphur contents even of concentrates so as to be innocuous to mercuric amalgamation. The sulphur left in the ore should never be allowed to exceed two per cent. A forty per cent pyritous or other sulphide ore should be roasted in a revolving furnace in thirty to forty minutes, and without any auxiliary fuel. For ordinary purposes a 40-foot chimney is adequate for furnace work; such a chimney four feet square inside at the base, tapering to 2' 6" at the summit, will require 12,000 red bricks, and 1500 fire-bricks for an internal lining to a height of 12 feet from the base of the chimney shaft. When second-hand Lancashire or Cornish boiler flues are available, they make admirable and inexpensive chimneys. The advantage of wrought-iron or steel chimneys lies in the convenience of removal and erection. They should be made in sections of 20 feet long, three steel wire guy-ropes attached to a ring, riveted to a ring two-thirds of the height of the chimney, and attached to holdfasts driven into the ground; tightening couplings should be provided for each wire. [*] For full details of the most recent improvements in the cyanide process and in other methods of extraction, the reader is referred to Dr. T. K. Rose's "Metallurgy of Gold," third edition.